Senna statue caught in amazing 3D photo! 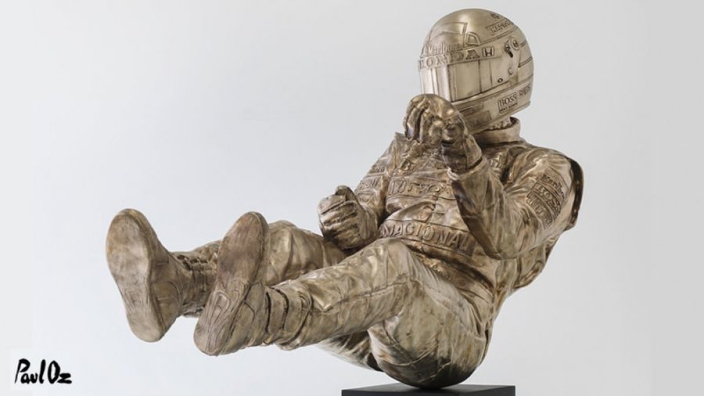 The Autosport International show is always a highlight of the year for motorsport fans, but one item in Birmingham this year has prompted as much praise as any other – a life-sized statue of Ayrton Senna designed by legendary artist Paul Oz. A shot of the legendary three-time world champion navigating through Eau Rouge and Raidillon at Spa-Francorchamps is the inspiration for the piece, which was struck in 160kg of bronze. If you're not able to make it to the NEC for the event, then fear not! The statue has been captured by Mark Haggan in this amazing 3D image – it's just like you're actually there! The statue took eight long months to complete and was created to mark the 25th year since Senna's tragic passing at Imola. Oz said of his work: "My painting style is to create as much dynamic as possible from a stationary image, and it was vital for me to portray that in a bronze statue too. "I'd been thinking for a while too to paint a driver floating in driving position… it's a position alien to most and even many F1 fans don't appreciate how extreme it is, even back in the 90's, although more so now. "If there's one thing I am happiest about with this statue is the dynamic and balance of the position."